After a cross-country road trip from Orbital Sciences Corp. in Virginia last week, technicians have unpacked NASA's NuSTAR X-ray telescope at Vandenberg Air Force Base in California and begun methodically checking the craft for the final time before its launch date in mid-March. 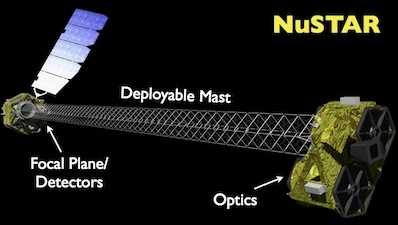 The Nuclear Spectroscopic Telescope Array, or NuSTAR, is the space agency's next astrophysics probe. NuSTAR is a black hole hunter, and its innovative X-ray optics will explore the universe at unmatched sensitivities at high-energy wavelengths. "We have a lot of exciting observations planned for the first six months," said Fiona Harrison, NuSTAR's principal investigator from the California Institute of Technology. "Everybody's getting really psyched." NuSTAR will be mated to a 25-ton Pegasus XL launch vehicle around Feb. 17, if all goes according to plan, and the 800-pound spacecraft will be enshrouded inside the rocket's nose cone in the last week of February, according to Yunjin Kim, NuSTAR's project manager at the Jet Propulsion Laboratory in Pasadena, Calif.
Technicians will tow the 55-foot-long booster underneath an Orbital Sciences L-1011 carrier airplane March 4, and the jumbo jet will haul the Pegasus launcher and NuSTAR from Vandenberg to Kwajalein Atoll in the Marshall Islands two days later, based on the current schedule. The three-stage, winged Pegasus will be dropped from the L-1011 mothership in the predawn hours of March 15, Kwajalein time, and fired into an equatorial low-inclination orbit more than 340 miles high. 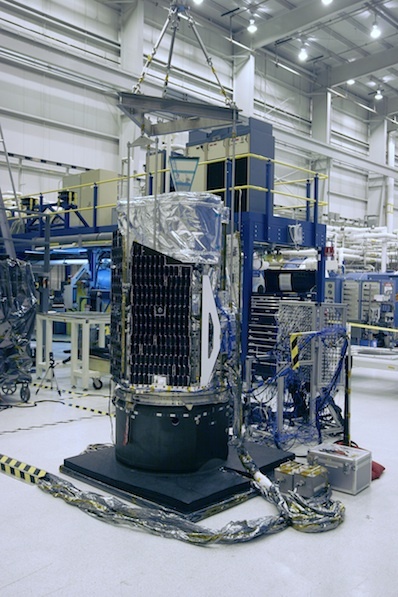 The launch is timed for approximately 10:30 a.m. EST (1430 GMT) on March 14, but engineers will select the final launch window in the coming weeks. One week later, the NuSTAR satellite will extend a 33-foot mast with the telescope's precision coated mirrors. NuSTAR's two X-ray detector units are housed inside the craft's main body. The deployable boom, coupled with new multilayer mirror coatings, allows NuSTAR to bring the high-energy X-ray universe into focus. "Most X-ray telescopes have long focal lengths, or distances, between their optics and the detectors," Harrison said. "The reason for that is that it's only really possible to reflect X-rays at very glancing angles off of optics, and that requires that you have the detector far away." The observatory will see the sky in wavelengths between 6,000 and 80,000 electron volts, about the same energies as a dental X-ray. NuSTAR will be the first focusing telescope to observe X-rays at such wavelengths, according to Daniel Stern, the mission's project scientist at JPL. The European Space Agency's INTEGRAL space telescope observes in a similar range of energies, but NuSTAR is several hundred times more sensitive due to its focusing ability. "At the resolution of INTEGRAL, you see maybe a half-dozen sources near the galactic center," Stern said. "NuSTAR's focusing X-ray optics buys us a large gain in how tight the resolution is. It will let us see several hundred sources in a similar exposure time, and the science you get from that is just immense." Harrison said one of NuSTAR's first research targets will be Sagittarius A*, the supermassive black hole at the center of the Milky Way galaxy. Together with other observatories, such as NASA's Chandra telescope, NuSTAR will help explain the cause of occasional X-ray jets emanating from the black hole, which could be signs of planets being swallowed by the object's extreme gravity. NASA's Chandra X-ray Observatory captured this image of Sagittarius A, the region of the Milky Way's supermassive black hole. 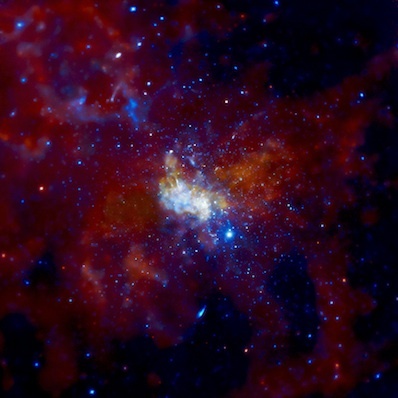 NuSTAR will study the same region in higher energy X-rays. Credit: NASA/CXC/MIT/F.K. Baganoff et al. "You can start studying variability and what is going on with the black hole at the center of our galaxy," Stern said. "You can study the nearby populations of neutron stars, black holes, pulsars, and highly-magnetized neutron stars called magnetars. There is very broad science that will come out of that dataset." NuSTAR will also study other nearby black holes and survey the universe for other supernova remnants. "There are two objectives," Harrison said. "One is finding new black holes and trying to understand their distribution, their distances and their global properties. And the other is studying black holes that we know and trying to understand what they look like in detail." According to Harrison, NuSTAR could discover hundreds of new black holes hidden from the views of existing telescopes. It will also try to find the heat source of the solar corona, the sun's scalding million-degree atmosphere. NASA has approved the $165 million mission for at least two years of observations, but scientists expect the spacecraft could continue returning science for up to seven years.